the poisonous parts of our wildness." Ever wondered what it's like to be a celebrated Hollywood actor from the age of eleven? With insightful, no BS, cards-on-the-table poetry that is quite serious yet has fun with metaphor, imagery, and language itself, author Amber Tamblyn gives readers a backstage pass to the show inside her mind. 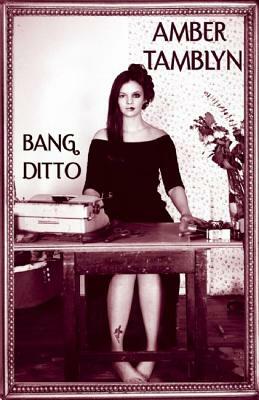 Whether she's describing real life info-gathering for a new prime time TV drama ("Role Research") or addressing the crossroads of public perception and private life ("Fell Off"), Amber Tamblyn reveals questions, answers, and more in "Bang Ditto," wielding metaphors mercilessly in a wry and talented voice. "Tamblyn's witty personal accounts and surprisingly lyrical observations go way above the scripted bullsh*t spouted by most of her peers." --"The Onion A.V. Club""Punchy, spiky, and flush with a young writer's love of language, the collection often deglamourizes the acting business. A great find..."--Barbara Hoffert, "Library Journal"
Amber Tamblyn is an Emmy and Golden Globe Award-nominated actor and poet. She came to fame on the soap opera "General Hospital" followed by starring roles on the television series "Joan of Arcadia "and "The Unusuals." She has branched out into film roles, appearing in "The Sisterhood of the Traveling Pants" and many other films. Winner of a Borders Choice Award for Breakout Writing, the author currently resides in New York. Amber Tamblyn is an Emmy- and Golden Globe-nominated actress and poet. She came to fame on the soap opera General Hospital followed by a starring role on the television series Joan of Arcadia. She has branched out into film roles, appearing in The Sisterhood of the Traveling Pants and The Grudge 2.